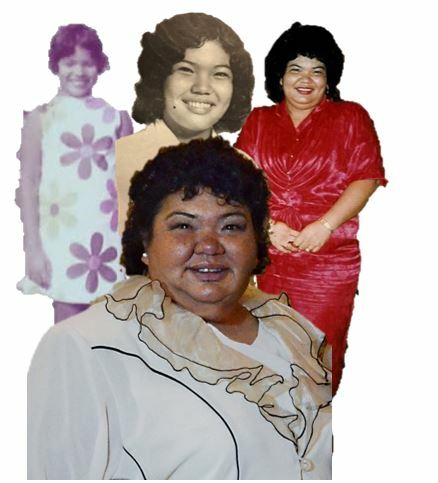 Susanna Delores Warner Cruz, 60, of Yona, Guam passed away Thursday, November 29, 2018 at Hardin Memorial Hospital, Elizabethtown, KY.
She was preceded in death by a son, Albert Silvestre Warner Palacios; her parents, Albert Leroy & Magdalena Villanueva Warner; one sister, Maxine Warner Acfalle; one brother, Edward Vincent “Benny’ Warner; two grandchildren, Angel Leroy, Magdalena Villanueva Warner; and a brother in law, Gavio Mateo. Survivors include: Two children, Franklin Edward Warner & his wife, Bobbie Fermin, LovieAnn Marie Warner-Palacios & her husband, Fred B. Terrado, Jr.; grandchildren, Lovischianna Elizabeth, Fredre’Oni Tristen-Victoria, Farrah-Lauren Catherine’ Susan, Angel Gabriel, Lovi’ annaFaith Annelise, Jesse Ryan, Ryan Jay, Hope Delores, Brandin and Christopher Ibarra, Brandi and Eric (Azariah and Aubrielle, Brittany and Landon (Ivie and Landon Jr.), Rayna and Robert, Raygene and Gregory (Persephone, Leisha, and Leighton); brothers & sisters, Francisco “Boya” and Clementine Warner, Maria Warner and Gavin Mateo, Edward “Benny” and Barbara Taitano-Warner, Maxine Barrett Warner and David Acfalle, Albert Lee Warner and Giovanna Peredo, Melvin Ray Warner and Shirley Gagan; and a host of family & friends. Visitation will be from 9:00 AM until 11:00 AM, Tuesday at St. James Catholic Church. A Mass of Christian Burial will be held at 11:00 AM Tuesday, December 11, 2018 at St. James Catholic Church, Elizabethtown, KY with Rev. Casey Sanders officiating.